It took my wife and I a while to finally try Netflix's series "The Ranch." We liked and were curious about the cast, a talented ensemble, many of whom we'd seen before on "That 70's Show," not to mention Sam Elliott and Debra Winger. However, the concept of curmudgeonly father and dysfunctional family was not a new premise, and we weren't sure we wanted to once again sit through ludicrous fails at familial harmony. Was that ever really funny? We finally decided to sit down and see if "The Ranch" could pull it off. It was a while into the series before we noticed that Sam Elliott produced the series, and it was Elliott's character Beau Bennett that first attracted our focus. Beau Bennett is the modern-day version of those characters Elliott played in westerns--right and wrong are clear-cut (and punishment trumps forgiveness), there's no need to discuss something because you either know it or you don't (and if you don't know "it," you're not worth knowing or respecting), and ultimately no one lives up to the standard (which is why they spend most of their lives alone). This last personality trait is what must have inspired the show's theme song to be Willie Nelson's classic "Mothers, Don't Let Your Babies Grow Up to Be Cowboys," who are always alone, even when they're with the one they love. My wife and I watched the first couple of shows, each episode being a half hour long, in the great tradition of TV sit-coms. We almost stopped at that point because of the excessive bickering within the family. With us, anyway, a little of that goes a long way. Then Ashton Kutchter's character Colt came to the foreground, Kutcher displaying a remarkable ability to move from very real emotion to two-dimensional comic characterizations and slapstick. This is especially true with the interaction between the Bennett brothers, Colt and Rooster (Danny Masterson). 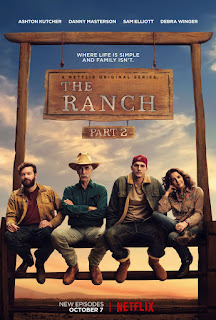 What further kept our interest was the inclusion in the series so many members of the cast of the "That 70's Show"; it was interesting watching those actors interact with one another within their new roles on "The Ranch." The script writing was sharp and lively, especially the ability of the writers to introduce and integrate material for a joke early in a show but not hit the punch line until much later. Script development continually evolved to include more drama, increasing the intensity of interactions between the sons and Beau, and Beau and his wife and later . . . let's call them girlfriends for lack of a better word. For us, Kutcher pulled the show for quite a while, the other characters being foils to Colt's foibles and foolishnesses. Although the cast really has ensemble status with all characters pulling a great share of the emotional load of the series, Kutcher's acting heightened the comedy of Colt's return to his hometown of Garrison, Colorado. His character was the locus, and Kutcher pulled off the highs and lows like a trapeze artist. The character of Beau Bennett is also a focus for the storyline. He owns the ranch, action focuses on his relationship with his wife and other women, and his sense of right and wrong is the reference point for the actions of the characters. Because of the courage of the series' treatment of the conflicts of the storyline, a great deal of action transforms from comedy to drama, transitions admirably accomplished by the cast. Much of the drama and comedy of the series is derived from the stereotype of the strong, silent male--so aptly portrayed through the years by Sam Elliott's acting. In "The Ranch" we see this stereotype in all its aspects, warts and all. We see its strength in holding up under adversity, and we see its weaknesses in terms of the ability to interact with others as fully realized adults. The male characters here don't get to shoot someone and then ride off into the sunset. They have to talk and share to succeed; they have to forgive rather than judge for the relationships to continue. This dynamic fuels much of the show: both the comedy and the drama. Danny Masterson with great acting precision displays the stereotype at its most two-dimensional worst, walking that knife's edge between hilarity and tragedy within the dysfunctional parameters of his characterization, maintaining just enough good-guy saves to keep his character fresh and believable. The character of Colt is the rebel for the cause of the strong, silent stereotype. He's willing to cry, to wear Uggs, to use hair products. He's willing, again and again, to denounce the myth, and therefore to be the true-to-life version of that stereotype (albeit a comedic version), expanding its boundaries to show that strong and silent doesn't mean rigid and mute. Even Beau Bennett's character changes, slowly and painfully, and that pain is experienced by Beau (the strong, silent hero tearing up and admitting that he has done wrong) and by his family when his unbending, rigid response to human emotions and frailties causes divorce and ruptures in his closest relationships. The series portrays real human drama in its latter episodes, the drama becoming so intense that the canned laughter at the jokes jarred with obvious artificiality. This was great stuff, superior work by the entire series' production personnel. The last two or three episodes of the fifth part reveal how serious the production was of exploding the myth of the strong, silent male. I'm going to add a spoiler here for analytical support, so those who don't want to know, stop reading. Part 5 ends with hugs between Colt and his dad, but as viewers, we want to tell Colt: "All those denouncements you shouted at your dad, how he always hits the negative--Colt, those were accurate." OK, Colt and Beau hug, but it's as if one of Beau's hands holds a knife, forgotten by both in the fullness of the moment. At some point in the future, Beau will shove that knife into his son's body, either that or the writers will cop out and Beau will mysteriously morph into a different person. Do my wife and I want to hang around to see the blood and hear the screams? Only if we acknowledge that the show itself has morphed from comedy to horror. "Colt, don't go into the basement with your dad! Don't go down those stairs with him right behind you! Don't, you fool! Don't!"